Although China is more at a rocket like speed in economic growth, the truth is many areas are still existing in third world conditions. Areas in eastern China, with sea ports in close proximity, have benefited from Special Economic Zones and global trading. Jobs in these areas are plentiful and 300 million people, the size of the USA, have access to basic education. In the western areas of China, especially in remote, rural areas, this global trade has not reached the local people. Of the 1 billion plus people still living in poverty, hundreds of millions still have no access to basic health and sanitation, education, or good jobs. China Care International has been helping in these areas for many years, and continues to see the need for schools to be built, or improved for the childrens safety. Some need to be made accessible for local children without school who have no way to reach the classroom. Guizhou is one of the poorest provinces in China. Many children still dont have access to schooling past the third grade, and some have no access at all. One school that was available was operating in unsafe conditions. Because this school is in an agrarian area, there were constantly animals and livestock roaming around. There was no wall or fence to protect the children and they were being attacked by cattle. This has been an extremely dangerous situation, but the village has no way to do this by themselves. They have asked the CCI for help. China Care went in and help fund a wall that now separates the school area from the cattle being herded or walking free range. The children can now go to school safely and focus on their studies. 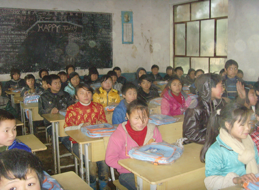 Not too far away, in the township of She Qi, there is a much smaller school of 117 students. CCI joined hands with a local charity group to build this school. All of the students are Yi and Miao minority. They grow up speaking their local languages at home. Without this school, they would not have an opportunity to learn Mandarin, the language of trade in China. This handicap would keep them from earning money and through them affect there communities. Going to school for the first three years allows them to learn the language that will help them and their community rise from generations of poverty. Even after the school was built, there were still no restroom facilities for the students. This presented an unsanitary situation for the children. CCI helped build a restroom for the school, many of the diseases that kept the children from learning and caused their parents to spend precious resources on healthcare are now controllable. China Care has also been able to conduct a Christmas program where every child received a free backpack with several necessities inside like hygiene, stationary, etc. The children have never received any sort of present, to receive this is so exciting for them. Even learning they will get their own pencil causes them to squeal with excitement. The hygiene supplies, together with the school supplies and the backpack, are all made in Chinese factories, and so for a fraction of the cost elsewhere, CCI is able to give these children more then just a present they adore, we are able to give them a jumpstart in their education. Thank you to all of our supporters for helping these children have a brighter future.